Maria Popova, curator of the deservedly well-known Brain Pickings, began in April a series called Book Spine Poetry (see Volumes 1, 2, 3, 4, 5, 6). Last week, Glynn Young introduced to TweetSpeakPoetry readers the prompt, which is too irresistible to pass up. Many of us having been having fun with it. (Be sure to read the comments to Glynn's post.) Here are a few of my own book spine poems. Please feel free to share your own "found poems" in the comments section. The following were inspired as I browsed the virtual shelves of Barnes and Noble. you and three others are approaching a lake. Surviving has made me crazy. I was delighted to find this Motionpoems animation of "Sea Salt" by Colorado's Poet Laureate David Mason. My profile of Mason, who was appointed for a four-year term that began in July 2010, is here. The animation is the work of Amy Schmitt, an illustrator and the creative director of Motion504 in Minneapolis, Minnesota. you lose. But getting up is great. * Quoted from interview with Hiroshima survivor Toshiro Ogura in Hiroshima in the Morning by Rahna Reiko Rizzuto (Feminist Press of City University of New York, 2010). A trailer for the award-winning book, which I read recently, is here. Take some time to chill with today's edition of Saturday Sharing. Start at the top or skip around; just don't tell me there's nothing here to interest you. ✦ The online magazine Urban Ghosts is all about abandoned and forgotten places, "hidden" history, and "alternative" travel. Urban explorers will find plenty to hold their attention. ✦ If you have children who enjoy making art, treat them to a low-cost membership with The Imagination Factory, where they'll also learn about recycling and reusing solid waste materials. ✦ Mike Urban's "The Cretaceous Garden" will take you back a few million years. ✦ In addition to presenting Poems of the Week, the poetry blog THEthe includes a Poetry Comics section curated by poet and artist Bianca Stone. You can follow Stone's own blog here. ✦ If stats are your thing or you're looking to bolster your arguments with facts, visit Gapminder, which offers an unparalleled body of data. The Website has a section for teachers, in addition to videos and data visualizations. Hans Rosling is co-founder of Gapminder Foundation, a nonprofit in Stockholm, Sweden, whose aim is to replace myths with facts and to "show major global development trends with animated statistics." ✦ New York Neon blog is dedicated to documenting old neon signs. The collection is to be issued in Thomas E. Rinaldi's book of the same title later this year by W.W. Norton. Also see Rinaldi's New York Neon Website, which features images of more than 400 signs Rinaldi has been documenting since 2006; the images are grouped categorically. Rain of Poems over London / Bombardeo de poemas sobre Londres from Casagrande on Vimeo. ✦ Syria-born and current Los Angeles resident Suhair Sibai uses the female form to to explore identity and the self. Her large mixed media canvases are stunning. Also see the work of Yari Osovany (video) and Farnaz Taghavi. ✦ Grain is a photography collective launched this year. ✦ Encyclopedias, dictionaries, and other reference books have never been quite the same since artist and scientist Julia Strand got her hands on them. See her creations at HokeyStokes! ✦ Imagery for the art of Karen Margolis is inspired, she says, by enso, Japanese for "circle", a sacred Zen Buddhist symbol for infinity and perfection. 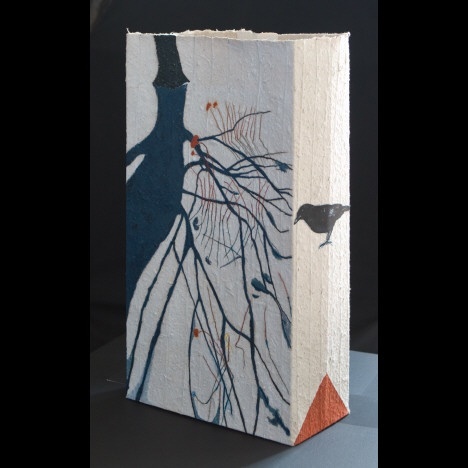 All the pieces in her Integration and Molecular Works series are created with hand-made Abaca paper. ✦ In doing some research for my poem about Alan Turing, I learned that the late artist Sir Eduardo Paolozzi, whose mosaics grace the Tottenham Court Road underground station in London, created a series of Turing-related prints, none of which uses Turing's face or body as imagery. See the prints. The Turing suite also may be viewed here. Also see Jin Wicked's print. ✦ The Textile Arts Center, Brooklyn (Park Slope), New York, which seeks to preserve and promote textile handcrafts, has launched SHOP, featuring kits, books, apparel, paper items, home goods, and more. ✭ The Sonoma Valley Museum of Art, Sonoma, California, is presenting through September 23 "Cross Pollination: The Art of Lawrence Ferlinghetti". 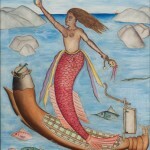 Divided into four themes — Her - Woman, The Sea, Liberation/Pacificism, Art and Literature — the exhibition showcases Ferlinghetti's paintings, graphic works, and writings, including poems. Lawrence Ferlinghetti's artwork can be seen at George Krevsky Gallery in San Francisco. This video interview with the poet at his easel and at a gallery opening is from KQED Arts. 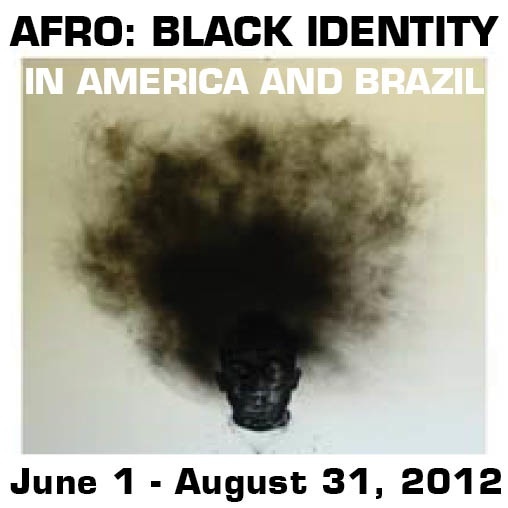 ✭ The Tamarind Institute's latest group exhibition, involving paired bi-national artists, is "AFRO: Black Identity in America and Brazil". Participating are Brazilians Rosana Paulino, Tiago Gualberto, and Sidney Amaral, all of Sao Paulo, and Alison Saar (Los Angeles), Willie Cole (Somerville, New Jersey), and Toyin Odutola (San Francisco). Tamarind invited the artists, who are in residence through August, to create lithographs that explore the complexities of the issues of racial identity, equality, and inclusion in Brazil and the United States. Charcoal and Smoke, 39" x 39"
Alison Saar and Rosana Paulino were the first pairing; images of them in Tamarind's Workshop are on FaceBook. Gualberto is paired with Cole, and Amaral with Odutola. Their prints are wonderful. Visit the exhibition online (pdf). 23" x 12" x 6-1/4"
✭ The Savannah College of Art and Design's Lacoste, in Lacoste, France, is presenting at La Galerie Pfriem through September 1 "Streaming Spirits: New Prints by Kiki Smith and Valerie Hammond". The show features 12 prints by the renowned artists that were created with the help of undergraduate and graduate printmaking students at SCAD Atlanta. 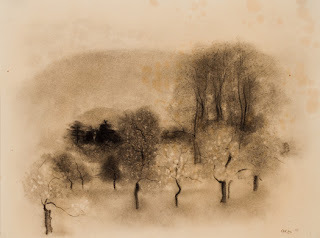 The techniques used to create these marvelous prints include lithography, photogravure, and letterpress. Among the prints are Smith's Color Noise, an accordion-fold lithograph of self-portraits, and Hammond's apports, a four-color photogravure of Smith's back. An illustrated catalogue accompanies the exhibition. The image of Hammond's stunning apports is included in the press release, which also includes brief biographical information about both artists.
. . . [T]hink in your mind a blessing for yourself. . . . The following is a guided metta ("lovingkindness") meditation led by Sylvia Boorstein during a conversation she had with Krista Tippett of On Being before a live audience in Detroit. Boorstein teaches at California's Spirit Rock Meditation Center. I was drawn to how Boorstein framed this meditation as a blessing for oneself. Try the meditation and share your experience of lovingkindness. May it leave you feeling at peace. Boorstein's Website includes instructions for a "do-it-yourself mindfulness retreat". It also includes a "Metta Sutta" ("The Buddha's Sermon on Unconditional Love"). The ArtForum, an arts magazine to which I subscribe, recently spotlighted the first solo exhibition in Paris of New York City-based artist Amy Sillman. Included in the Castillo/Corrales exhibition is Sillman's video Draft of a Voice-Over for Split-Screen Video Loop (2012). The video, which can be viewed here on Sillman's Website, comprises some 2,000 iPad drawings and animations by Sillman and a voice-over of a poem by Lisa Robertson; the text is spoken by the artist. The evocative, six-minute looping video is a fascinating artistic collaboration, giving Robertson's words a simultaneously visual and aural representation. Sillman has said that painting is "a physical thinking process to continue an interior dialogue"; she brings that concept to realization in this project and others with poets. On the same Website page you'll find Pinky's Rule (2011), a seven-minute video collaboration with poet Charles Bernstein that Sillman made on an iPhone. The video also can be seen on BOMB Magazine. Sillman, who made several thousand images for the video, reads Bernstein's poem. vying with outstretched hands, flayed fingers, in-turned palms. writing something else, something flat. . . . The Poet Laureate of Georgia is Judson Mitcham, who began his term this past May. Mitcham succeeded David Bottoms, who served from May 2000 until May 2012. Information about the uncompensated state-established position is included in my earlier post about Bottoms. 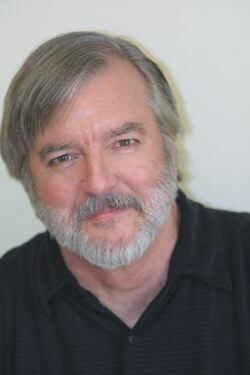 Mitcham told an interviewer that in addition to participating in readings and other literary events throughout the state, he aim to "make people aware of the many accomplished poets who live in Georgia." 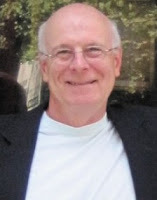 Poet and novelist Judson Mitcham, Ph.D., has published, most recently, A Little Salvation: Poems Old and New (University of Georgia Press, 2007) and This April Day (Anhinga Press, 2002). His first poetry collection Somewhere in Ecclesiastes (University of Missouri Press, 1991) was honored with a Devins Award. Mitcham's novels The Sweet Everlasting and Sabbath Creek made him a two-time winner of the Townsend Prize for Fiction (1998 and 2006), which is awarded by the Writers Institute at Georgia Perimeter College, co-sponored by Georgia Center for the Book. The former was a finalist for the Southern Book Critics Circle Award. Perkolater Press in 2007 published Heart of All Greatness in a letterpress edition of 65. Illustrations are by book artist and letterpress printer Amy Pirkle. The poems, whose subject is fathers and their relationships to their sons, are reprinted from This April Day. Perkolater Press also published in an edition of 25 a broadside of The Sweet Everlasting. Family relationships, identity and place (Mitcham grew up in Monroe, Georgia), Southern culture, time's passage, memory, change, death and loss, and futility are among Mitcham's themes. Spirituality, as reflected in the treatment of issues such as redemption, also is present in Mitcham's poems, which tend toward the ruminative and philosophical and sometimes have a decidedly elegiac tone, especially if written in first person. 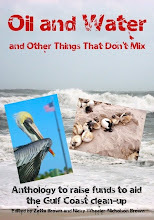 Both a narrative and lyric poet, Mitcham mixes it up; even quick perusals of his collections reveal that he follows no set style or form, sometimes writing in couplets, tercets or quatrains, other times employing poetry as prose; some poems are short, others dozens of stanzas long. Mitcham leaves us at the end of this moving poem with the shattering knowledge that "Our mother had a twitch in her eye, nothing more / when I took her to the doctor, // eleven years ago, this September." We need no more detail. ~ From "In the Sweet By and By"
What if every prayer for rain brought it down? ~ From "History of Rain"
Poetry by Mitcham has appeared in such highly regarded literary journals and periodicals as Chattahoochee Review, Georgia Review, The Gettysburg Review, Harper's, Poetry, Poetry Daily, and Southern Poetry Review. In addition to being named Georgia Author of the Year by Georgia Writers Association, Mitcham has been awarded a Pushcart Prize (1989, for the poem "Explanations") and fellowships from Bread Loaf Writers' Conference, the National Endowment for the Arts, and Georgia Council for the Arts. Mitcham has taught poetry and fiction workshops at Mercer University, Macon, and creative writing at University of Georgia and Emory University. Judson Mitcham reads "An Introduction", "Lyric", "Night", and "Forever" from A Little Salvation on YouTube. about what the best literature does. . . .
Today's finds include a garden of LEGO® sculptures, the Internet Hall of Fame, a directory of "green" blogs, and a living art project in Italy in which anyone with a gardener's thumb may participate. ✦ The Internet Hall of Fame is now 20 years old. Here's the latest list of inductees. ✦ Looking for "green" blogs? Try Best Green Blogs, a directory of blogs from around the world that are themed to sustainability, ecology, environmentalism, and other "green" subjects. ✦ Who knew?! Kansas ranks third in the United States in the number of grassroots art sites. See Grassroots Art to learn more. ✦ The Garden Map living art project at Cassano d'Adda is getting a lot of attention. It's a very creative way to think about maps and their uses. You don't have to live in Italy to participate. ✦ Pages from Keith Haring's journals from 1971 to 1989 are posted at this Tumblr site. A large exhibition of Haring's work recently was mounted at Brooklyn Museum. ✦ The trailer for a documentary about Marina Abramovic, The Artist Is Present, may be viewed here. ✦ This 15:52-minute film by Eric Minh Swenson present the marvelous paintings and works on paper of Los Angeles figurative artist Ruth Weisberg. The exhibition "Ruth Weisberg: Now & Then", at Jack Rutberg Fine Arts (the exhibition closed June 30), was part of the highly praised J. Paul Getty Museum initiative "Pacific Standard Time: Art in L.A. 1945-1980". ✭ The University of Chicago's Smart Museum of Art continues through August 26 "Drawing Inward: German Surrealist Richard Oelze". Included in the exhibition are drawings and sketches of "imaginary landscapes, fantastic objects, and figures" that the Bauhaus-trained artist drew post-World War II. Included in the 1936 exhibition "Fantastic Art, Dada, Surrealism" at the Museum of Modern Art, Oelze subsequently fell into obscurity. ✭ In Rockford, Illinois, Rockford Art Museum joins many other institutions in celebrating the 50th anniversary of the Studio Glass Movement with "Into the Light: Illinois Glass", on view through October 21. The exhibition showcases the exceptional work and examines the influence of eight contemporary glass artists: Nicolas Africano, William Carlson, Jose Chardiet, Katja Fritzsche, Jon Kuhn, Joel Philip Myers, Thomas Scoon, and Janusz Walentynowicz. Also included is glass from RAM's permanent collection. ✭ Billed as "the largest and most ambitious selection of works by the U.S. artist ever to be shown in Europe", "Hopper" at Thyssen-Bornemisza Museum includes loans of Edward Hopper paintings from major museums, including New York's Metropolitan Museum of Art, Museum of Modern Art, and Whitney Museum of American Art. The exhibition, in Madrid, Spain, where it is on view through September 16, comprises 73 paintings, drawings, prints, and watercolors; one section focuses on Hopper's time in Robert Henri's studio at the New York School of Art and his training; a second, arranged thematically, displays mature work by Hopper alongside work of other artists of the time, including Felix Vallotton, Walter Sickert, and Edgar Degas. According to information on the museum's Website, the last room of the exhibition is set up as a film set where American filmmaker Ed Lachman has re-created as a 3D installation Hopper's Morning Sun (1952) with the aim of creating a "dialogue between Hopper's influence on film and its influence on his work." A catalogue in Spanish accompanies the exhibition. 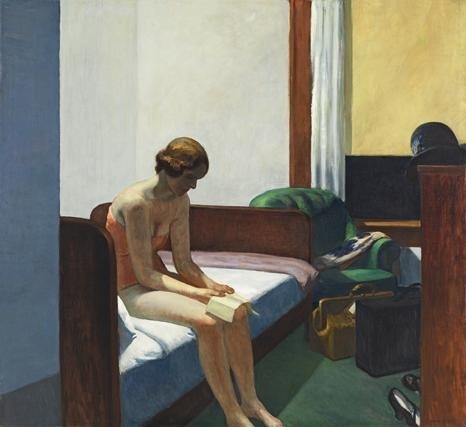 The Thyssen-Bornemisza Museum owns the most significant collection of Hopper's work outside the United States. Yesterday I came across an article about "poetry-reading dresses". Part of the Lace Sensor collection by designers Anja Hertenberger and Meg Grant, the clothing "speaks" its embedded prerecorded poems when triggered by a touch. Read the article and watch the video below to understand the technology behind the creations, which debuted this month in Vienna, Austria, at the TechnoSensual Exhibition. Be sure to visit the designers' Websites and blog to learn more about Lace Sensor (in-process photos are provided) and to view other interesting projects, including "TK 730", which involves the use of a manual knitting machine. My thanks to Harriet Poetry blog for the article link. In this terrific trailer for the novel Us by Michael Kimball, a single sentence is animated beautifully by Luca Dipierro. palm, pays a ransom to ambition. the pinky, two long love marks. her lover's shield, her Girdle of Venus. This poem varies somewhat from a draft I left in the comments section of a recent post at TweetSpeakPoetry. I used as my prompt the phrase "within the lines of her", part of the poem that accompanied the lovely watercolor She Breathes Cerulean by Michelle ("Shell") Rummel of Shell Artistree. I've had a desire to give back, with stories and poems. Poet, children's book writer, and professional storyteller Marc Harshman is West Virginia's Poet Laureate. He succeeds Irene McKinney, who served the state for some 18 years, until her death in February of this year. In announcing the appointment May 18, 2012, governor Earl Ray Tomblin singled out Harshman's creativity, which he said "serves as a reminder of the immeasurable talent of West Virginia's authors." Harshman has noted in interviews that one objective as Poet Laureate will be "seeing what I can do to support the life of writers here in the state of West Virginia," where, he adds, there is "a very vibrant, healthy community of writers of all genres." Information about the position of state poet, who serves at the will of the governor and receives a $2,000 stipend annually, is included in my post about McKinney. Crediting a "language-rich household" with making him a writer, Wheeling resident Marc Harshman has published a number of chapbooks: Local Journeys: A Collection of Poems (Finishing Line Press, 2004; 2006), Three Poems (Costmary Press, 1987), and Turning Out the Stones (State Street Press, 1983). His Rose of Sharon: Poems was published by Mad River Press in 1999. Some of his work has appeared as limited-edition broadsides. Themes including community, relationships, nature, addiction, time's passage, and the spiritual characterize Harshman's prose and poetry. Place — his childhood in Indiana, his long residency in West Virginia, and his travels abroad — exerts a strong influence in Harshman's work and roots it. His three decades in West Virginia, he says, are "a singular blessing" to his writer's life. grass-blade thin and sharp they remain. Harshman has published poems in dozens of journals, including Atlanta Review, Blueline, Cider Press Review, The Bitter Oleander, Equinox, The Georgia Review, Southern Humanities Review, Shenandoah, Poetry Northwest, The Progressive, The Innisfree Poetry Journal, Sycamore Review, Tipton Poetry Journal, and Tusculum Review. He is anthologized in Wild Sweet Notes: Fifty Years of West Virginia Poetry 1950-1999 (Publishers Place, 2000; the poems from Harshman are "Them", "There Will Be Dancing", "Oxford", "Checking the Spring", and "Clark Hill"), Wild Song: Poems of the Natural World (University of Georgia Press, 1998; "Byng Inlet, Ontario"), and The Anthology of Appalachian Writers (Shepherd University, 2012), among other collections. In addition to receiving a poetry fellowship (2000) and a fellowship in children's literature (2008) from the West Virginia Commission on the Arts, as well as a fellowship from the University of Minnesota (1994), which he used to research Scandinavian myth and folklore, Harshman has been nominated for a Pushcart Prize and has won a Literal Latte Journal award for his prose poems. Other honors include a 1995 Smithsonian Notable Book for Children prize (for The Storm) and a Parent's Choice Award. He was 1995 West Virginia English Teacher of the Year. His prose poem "In the Company of Heaven" won a Newport Review flash fiction contest. In addition to a master's degree in English from University of Pittsburgh, Harshman holds a master's degree in religion from Yale University Divinity School. Finishing Line Press, Powell's Books, and West Virginia Book Company carry several Harshman titles. Today's edition of Saturday Sharing will take you below the New York Public Library, show you where to find images of war, let you listen to poetry, and lead you to a place devoted to books. You'll also be linked to the video selection Crow Moon and be introduced to "Little Sun" by Olafur Eliasson. ✦ Here's a wonderful site to explore: Underground New York Public Library. ✦ More than 350 war images from collections of The National Archives, United Kingdom, have been uploaded and are available to view here. Eventually, several thousand images will become accessible online. ✦ Some of the great poets are finding new life; er, at least their voices are coming to life again. Thanks to Poetry Reincarnations, we get to hear the likes of Sylvia Plath, William Blake, Ezra Pound, Walt Whitman, Rudyard Kipling, and many others. What can't computer animation do?! ✦ Go here to listen to readings by poet Jorie Graham. For a list of audio recordings in Woodberry Poetry Room's "The Listening Booth", go here. ✦ Try Books on the Nightstand for book recommendations, news about forthcoming books, podcasts, book group resources, and behind-the-scenes conversations about book publishing. ✦ Enjoy Crow Moon, a short made in 2006. It is entirely hand-drawn. ✦ Artist Olafur Eliasson is ingenious. Watch the video below then go to the Little Sun Website to learn more. Little Sun from Studio Olafur Eliasson on Vimeo. ✦ Fans of Frank Lloyd Wright will be pleased to learn that S.C. Johnson, Racine, Wisconsin, has opened The S.C. Johnson Gallery: At Home with Frank Lloyd Wright, showcasing rarely seen designs and artifacts. Objects on display are on loan from the Frank Lloyd Wright Foundation. The company also has amassed a significant collection of documents, blueprints, books, and DVDs related to Wright's contributions to Racine; the collection is housed in the Frank Lloyd Wright Research Library. Wright designed the Administration Building and Research Tower on the S.C. Johnson campus; brief information about Wright's buildings is here. ✦ Alice Simpson is a sculptor and the creator of one-of-a-kind and limited-edition, hand-made, hand-painted artist books. You'll find a selection here, beginning with Simpson's most recent, The Dancing Chancellor. Her dancing-inspired artist books are delightful, and collectible; so is her sculpture. 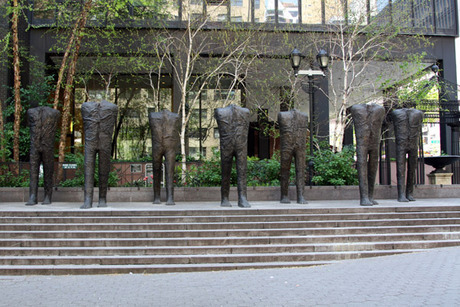 ✦ If you happen to be in New York City any time before the end of September, trek over to Dag Hammarskjold Plaza to see Magdalena Abakanowicz's "Walking Figures" (2009). 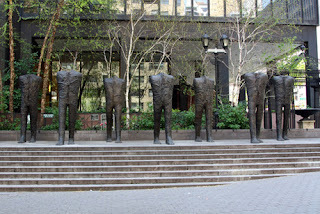 The magnificent sculptures, a group of 10 headless and armless bronze figures, each more than eight feet tall and each unique, are on view courtesy of Marlborough Gallery and the city's Department of Parks & Recreation. Bronz, Variable (98"-103" x 33"-35" x 35"-49"
✦ Collectors take note! San Francisco's Crown Point Press has published Pat Steir's "Mountain in Rain", a beautiful color direct gravure. The new release is printed in an edition of 20. In celebration of its 50th anniversary, Crown Point is presenting until September 1 "Summer Choices", a show of work by Robert Bechtle, Pia Fries, Per Kirkeby, Sol LeWitt, David Nash, Laura Owens, Wayne Thiebaud, Richard Tuttle, and Fred Wilson. "Crossing Into the Eighties", an exhibition that included Steir's work and that of other Crown Point artists, closed June 30. 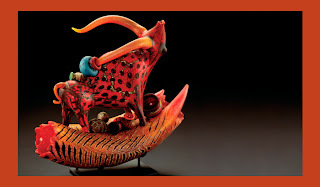 ✭ Work by Dale Chihuly, William Morris, Joey Kirkpatrick, Flora Mace, Ben Moore, Italo Scanga, and Lino Tagliapietra, among other masters of glass, will be on view in "Pilchuk: IDEAS" through January 1, 2013, at Museum of Northwest Art, La Conner, Washington. Early examples of studio glass are shown with mature work. The exhibition is part of a celebration marking 50 years of studio glass and the important role of the Pilchuck Glass School in the studio glass movement. ✭ In Madison, Wisconsin, Chazen Museum of Art, on the University of Wisconsin campus, also is presenting a show of studio glass: "Spark and Flame: 50 Years of Art Glass and the University of Wisconsin-Madison". The exhibition, on view through August 5, is in two parts, one focusing on the influence of Harvey Littleton, who began his career, as a ceramist, at UW in 1951, and created the first university hot-glass program in the United States; and a second showing nearly 160 works by more than 100 nationally and internationally prominent glass artists. Among Littleton's UW students were Dale Chihuly, Fritz Dreisbach, and Marvin Lipofsky, each of whom has created stunning work over a long creative, innovative career. ✭ Diane Rosenstein Fine Art, Beverly Hills, California, is exhibiting "The Washington Color School" through August 25. Included in the show are works by Thomas Downing, Kenneth Noland, Gene Davis, Howard Mehring, and Leon Berkowitz. ✭ Zane Bennett, Santa Fe, opens a show of Latin American art, including paintings, sculpture, and digital prints, on July 27. Among the artists represented are Chile's Roberto Matta and Mexico's Rufino Tamayo. Last week, the New York Time's Lens blog brought to my attention the "I Am Unbeatable" campaign of photographer, producer, videographer, writer, and activist Donna Ferrato, who for several decades has focused her camera on domestic violence and sought to use her photography to raise public awareness and inspire much-needed changes in public policy. Ferrato's multimedia "I Am Unbeatable" project seeks to "document and celebrate stories of self-empowerment" among women across America who have found the courage to rebuild the lives their batterers shattered. In the video below, which also appears at Indiegogo, Ferrato explains the project for which she is seeking funding. She has until the end of the day Friday, July 27, to realize her financial goal. If you have ever known even one woman who has suffered at the hands of an abuser — sadly, I know the details of stories of at least six women, two of whom were murdered — you know just how important Ferrato's project is. I have contributed to "I Am Unbeatable". I hope you will, too. I Am Unbeatable from donna ferrato on Vimeo.